One of the glaring omissions from the iPad’s announcement that seemingly convinced many potential buyers to hold off for version two was the lack of a front-facing camera. The inclusion of a camera has the potential to turn the iPad into a highly portable communications device, a role that many expected the iPad to fill. New evidence uncovered yesterday reaffirmed the likelihood that the iPad will eventually include a camera. 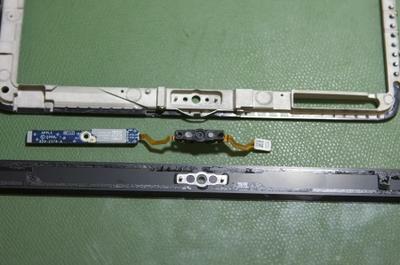 Mission Repair, a company that specializes in Apple product repairs, received a shipment of iPad parts that included the metal frame within the iPad. As seen with last year’s iPod Touch, they spotted what appeared to be a camera slot built into the top of the frame. Further, the slot is an exact match to the current iSight cameras used in the unibody MacBook. According to Mission Repair, the camera rests in line with the LED indicator signaling the camera to be on. The picture above shows the iPad enclosure (top), the MacBook iSight camera (middle), and the unibody MacBook screen case (bottom). Funky Space Monkey (don’t ask) was tipped about the iPad Steve Jobs was presenting with that showed in several frames what appears to be the inclusion of a camera in the exact spot of the frame’s positioning. Spotted at the 9:05 mark on YouTube, the reflection of light shows the an unknown space in the top center, presumably for an iSight. 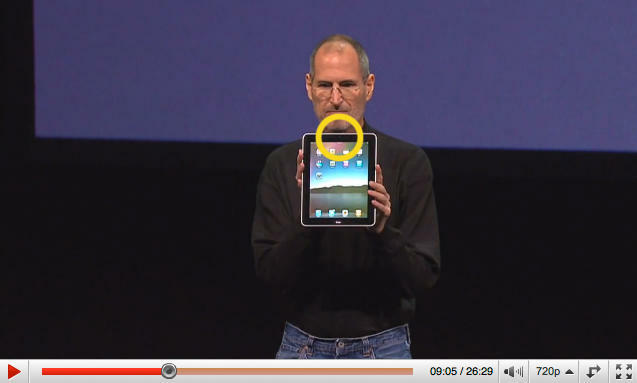 The same video is available on Apple’s website wherein the camera can be spotted around the 9:07 mark. This news follows Apple Insider’s discovery that the contacts application in iOS 3.2 (iPad-only) includes the option for taking a picture below the option to choose an existing one. On Friday, Engadget confirmed that this very same OS version includes built-in support for video calling with hooks to accept and decline a video conference and run a video call in full screen or partial screen. Together, it seems inevitable that Apple would include support for a front-facing camera. Whether they’ll slip it into the first gen that’s shipping in late March, the 3G enabled version shipping in April, or a future hardware revision is anyone’s guess. The iPad could suffer the same fate as last year’s iPod Touch wherein a camera slot was included but was rumored to be left out due to last minute technical difficulties. Only time will tell. When do you think we’ll see a front-facing camera hit the iPad? If they included it in the launch of the first gen, would you be more inclined to early adopt? Share you predictions in the comments!